This isn’t the plot of another Pitch Perfect movie. Even better, it’s the real life story of The After School Specials!, a 5C a cappella group that earned a wild card spot and is now one of 10 groups out of 400 to advance to the final competition. Angelica Virrueta ’18 (alto), Annalise Schweickart ’18 (soprano) and Russell Salazar ’19 (baritone) will travel with other members of The After School Specials! 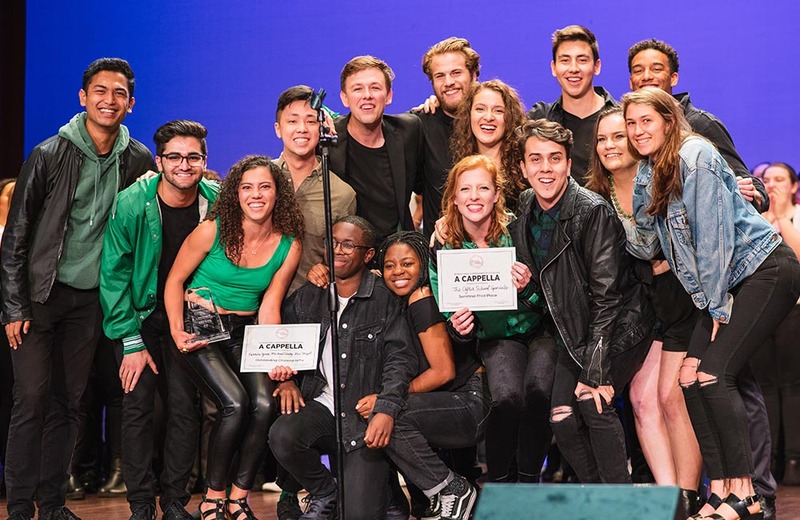 (a total of 15 students representing each of the undergraduate Claremont colleges) to New York City for the competition at the Beacon Theatre on Broadway April 21. After placing second in the quarterfinals in February, the group moved to the semifinals, contested in Salem, Oregon, in March. There, they won awards for best choreography and best soloist and placed third overall, performing Greedy by Ariana Grande, These Walls by Kendrick Lamar/Moss Kena and Jealous by Labrinth. Salazar says this is the first time any Claremont Colleges group has made it this far in the ICCA competition. The three Mudders have been with the group for four years. “We are excited and humbled to get to share the stage with some of the best college a cappella groups in the world,” Salazar says. The Specials will perform the same set of songs for the finals and have been working diligently to incorporate the feedback they received from their last competition. The group has set up a Go Fund Me page for anyone interested in helping them with competition expenses. Posted in: 5Cs, Competition, Music, Students.